Artist Mark Ulriksen explains his inspiration for depicting Martin Luther King Jr. alongside Colin Kaepernick in his cover for The New Yorker. 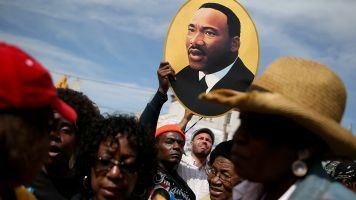 When it comes to Martin Luther King Jr., there's always that question. "What would he be doing now if he were still around?" artist Mark Ulriksen asked. Beyond that, as a civil rights leader who tackled issues of discrimination, how would he interpret modern protests? "If you oppose the tactics of Black Lives Matter, you would've abhorred King's. It fights the same injustices and encounters the same resistances," Simone Sebastian said in 2015 in a video for The Washington Post. Many have suggested King would've supported Black Lives Matter, for example, but what would that look like? Artists like Ulriksen speculate in their work. "I pictured in my mind's eye King, and what I saw was a man in prayer with his eyes closed, because he is a man of the cloth," Ulriksen said. "And I thought he's probably kneeling. And then I started thinking, 'You know who's kneeling in this day and age: NFL players, thanks to Colin Kaepernick.'" Kaepernick said during an interview in 2016, "This country stands for freedom, liberty and justice for all. And it's not happening for all right now." Kaepernick has been linked to King because of his protests. Just listen to this. Ulriksen has previously traveled through time with the late King. In 1995, The New Yorker published this cover with an oversized King huddled behind homeless people. Through his work, Ulriksen makes it pretty clear that he feels King still has a place in contemporary protests. "The protests that these guys are doing are similar to King in that they're doing civil disobedience and trying to say the world needs to change," Ulriksen said. "King's message still resonates."